Even the most skilled handyman isn’t a good replacement for a professional electrician. Our Mountain House electricians spend quite a bit of time wiring new construction projects and home additions, so they have the experience necessary to handle all electrical wiring in your home. Electricity is not a Do-It-Yourself project. It can be dangerous, and even deadly, if it is handled by someone without professional training. Even if you manage to get through a household fix without getting electrocuted, the repair may cause future problems in your electrical system. A badly wired addition or poorly attached connector can cause problems with electrical resistance that may lead to the wire burning out and starting a fire in the dead space between the walls. It is always best to contact a professional to handle this type of work. After all, saving $100 by wiring an outlet yourself doesn’t really matter if that outlet ends up burning down the house. Our electricians spend several years in school including a comprehensive internship and learn everything they need to so that your wiring is correctly installed in your home. This is especially important in new homes and home additions because they must pass an independent inspection. If the wiring is not up to code, you’ll have to pay more to get it fixed. This may be the number one reason to choose a professional with code experience over a handyman. 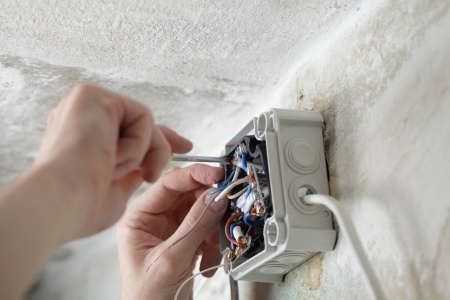 When you have a professional Mountain House electrician that knows all the ins and outs of installing electrical wire and breaker boxes, there is no chance that your home will fail an inspection. On the off chance that the home does fail, a professional electrician from our Mountain House service is fully insured to cover the costs of this error. You won’t be held financially responsible for our error. When you contract with our professional Mountain House electricians, you’ll always high-quality, professional service that you can depend on. Call our professionals now to schedule a service today!